TREATY OF PARIS « THE BRYCE IS RIGHT! – Today we celebrate an important anniversary. Today, we celebrate the signing of the Treaty of Paris. “The Treaty of Paris?” you ask, “What in the world is that? Does it have something to do with ending the Vietnam War?” Not quite. Actually, it is one of the most important documents in our history, ending a world war 231 years ago, and something young people should be cognizant of in terms of the history of our country. Most Americans would be surprised to learn our Revolutionary War had lasted nearly eight years, much longer than the World Wars and American Civil War. It began on April 19, 1775 with the Battles of Lexington and Concord, and ended on this date, September 3, 1783. Actually, it had ended two years earlier with the surrender of British General Cornwallis at Yorktown on October 19, 1781. Why the delay? We must understand the War was not simply between Britain and the Colonies. In reality, it had turned into a World War where Britain also faced France, Netherlands, Spain, and Mysore (southern India). This was based on the alliances the Colonies had built up during the War, particularly with France. Although fighting had stopped in the Colonies, the war continued in other areas, such as the Caribbean. 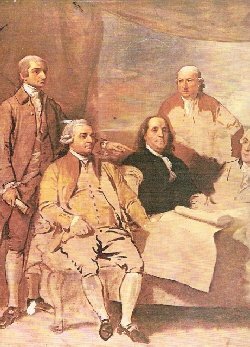 To negotiate the Treaty of Paris, the United States was represented by Benjamin Franklin (serving as an American commissioner), John Jay (serving as Minister to Spain), Henry Laurens (Peace Commissioner), and John Adams (special envoy to negotiate peace). One of the key points to the treaty was to have Britain recognize the United States as a free, sovereign, and independent state. Boundaries were also set, fishing rights established, and interestingly, both Britain and America would have perpetual access to the Mississippi River. This would, of course, change with time. Franklin was almost successful in having the British cede Quebec over to the Americans, but the British ultimately refused. Imagine the future of both Canada and America had Franklin been successful. In all likelihood, we would have probably become a unified North America. Because this was a World War, the British also had to negotiate separate treaties with France, Spain, and the Netherlands. By doing so, ownership of islands in the the Caribbean were reassigned, and Britain ceded its territorial rights in Florida over to Spain. With the Treaty signed and behind them, the founding fathers moved on to formalizing their government. By 1787, they had replaced the Articles of Confederation with the United States Constitution. George Washington would take the oath of office as President two years later. All of this would probably never have happened had there not been the Treaty of Paris. An interesting footnote: As one of the signers of the Treaty of Paris, Benjamin Franklin, became the only person to sign the three most important documents thus far in American history, the Declaration of Independence, the U.S. Constitution, and the Treaty of Paris. NEXT UP: RETIREMENTLAND – Do we ever truly retire? LAST TIME: EXCUSES – Why are the trucks breaking down? This entry was posted on September 3, 2014 at 6:00 am	and is filed under History. Tagged: Florida, palm harbor, The Bryce is Right, tim bryce, TREATY OF PARIS. You can follow any responses to this entry through the RSS 2.0 feed. You can leave a response, or trackback from your own site. Well done piece, as usual, Tim. Interesting too, considering initial British flirtation with tossing Quebec into the deal, that it took another 30+ years (and another war) to get Britain out of the Upper Midwest.